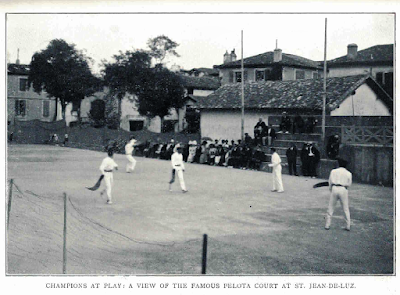 For those brave enough to don a barretina, but who could do with some rolemodels, here we go! Ponjemonje: the name sounded to Philo Bregstein (1932) like a spell in the ears, the key to an unreachable world. This was the name of the village in Lithuania where his grandfather came from, late 20th century to settle in Amsterdam. With the collapse of the Soviet Union, that world became again accessible, and in 1991 Bregstein, the cineast and writer, went there for the first time. 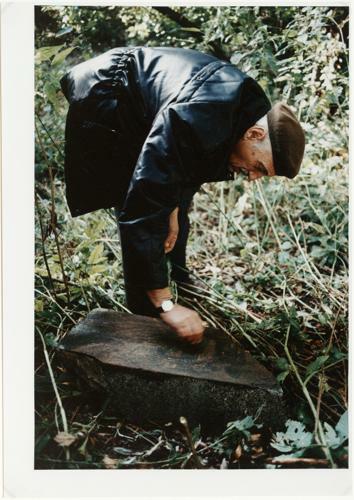 About this search for his roots, Bregstein made a film documentary and wrote the book Back to Lithuania: Traces of a Jewish family. Through a world-wide genealogical network of family members in America, Bregstein communicates with long lost relative Grisja in Panemune (as the name of the village is actually written). 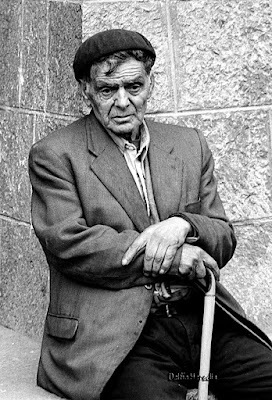 In 1941, Gisja was deported with his family to Siberia by the Soviets, where he lived in the industrial city of Barnaul after years of forced labor. For Grisja, thanks to his deportation, one of the few still living Jews from Panemune, his birthplace was also unattainable for half a century. For a poor bugger from Siberia his return is glorious. 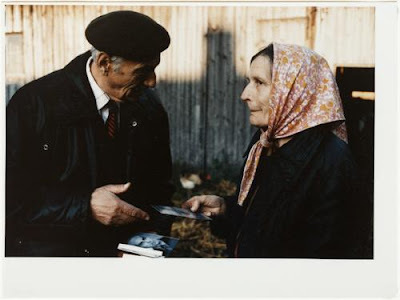 With Grisja as a guide, Philo returns to the Bregsteins family house, where the current inhabitants receive them with suspicion: "do those strangers claim their old possessions"? They also find the place where the family farm stood, until bulldozed in 1968. 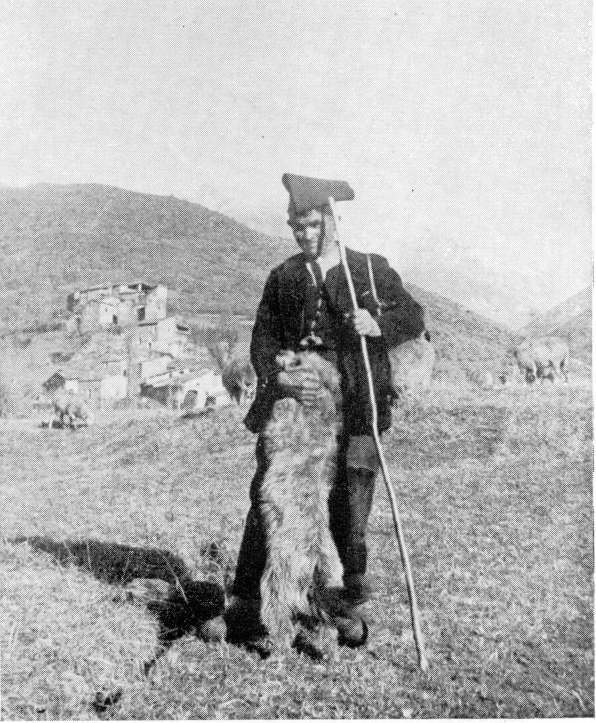 The Lithuanian Bregsteins proved to be an ordinary, fairly prosperous farming family who tried to assimilate as much as possible. 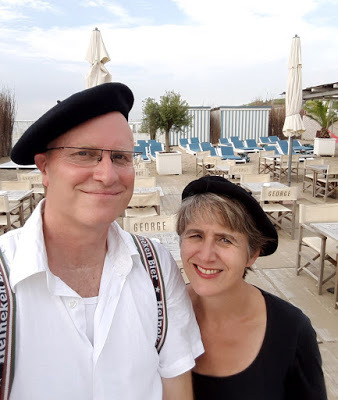 That pursuit will continue in Amsterdam, where Philo's father marries a non-Jewish woman and baptizes the children in the Dutch Reformed church. 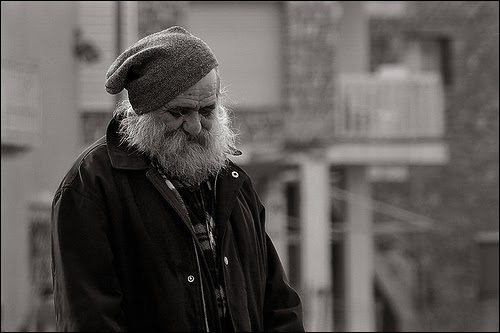 After several visits to Lithuania, the dreamy enchantment of 'Ponjemonje' has been driven out by a hard reality. 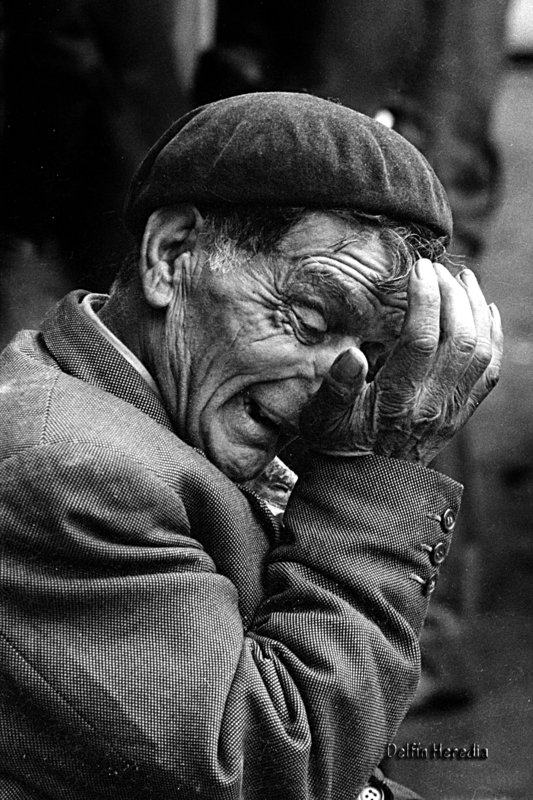 The family ties have been restored as far as possible, though, but the wounds of recent history are still deep. The cemetery was not demolished by the Nazis but by the Russians and the tombstones were processed into a bridge. 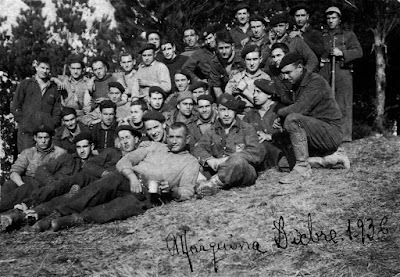 With Lithuanians, there is still a great resistance to talk about the history of the war, in which they were often involved. 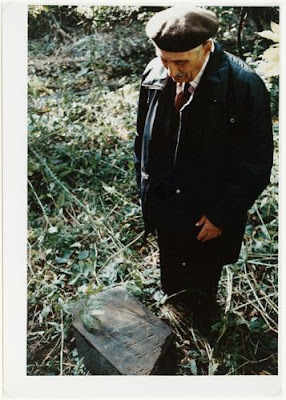 Thus, Bregstein learns that Lithuanian nationalists killed more than 15,000 Jews in an organized deceit between Soviet departure on June 22, 1941 and the arrival of the Germans three days later. Piet Mulder was born on the Dutch-Belgian border shortly after the First World War, in Sint Jansteen, where his father worked for Customs. The family moved to new Customs posts almost every year, to places such as Roosendaal, Winterswijk, Rotterdam, Leiden and Tiel to arrive in Amsterdam in 1934, where Mulder's father became Verifier on the Entrepotdok. Piet studied at the HTS (Technical College), after which he received painting lessons at the "Vrije Academie Artibus" in Utrecht for 7 years. 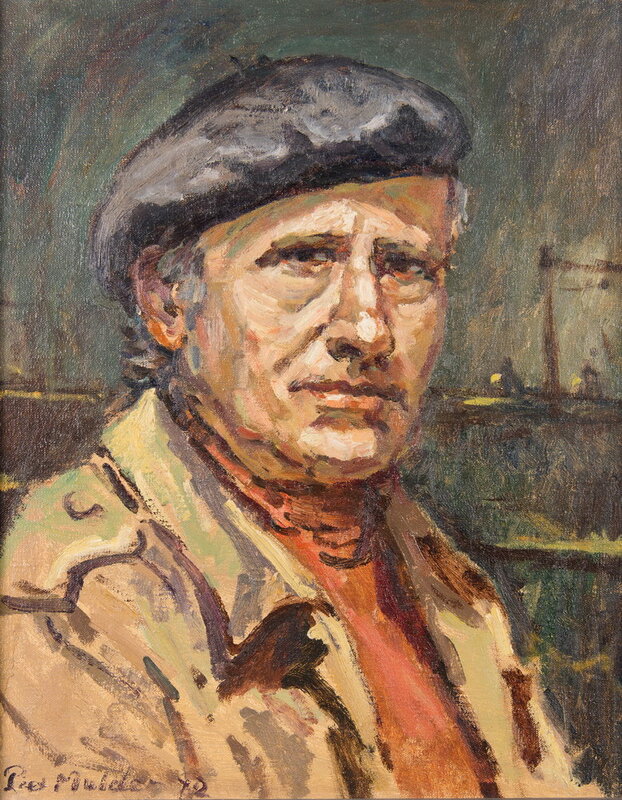 Piet Mulder was the painter of landscapes in the Betuwe (a region in the central Netherlands), seascapes and portraits for more than half a century. In the sixties he was one of the driving forces behind the Visual Arts Circle between the Great Rivers, where artists such as Marinus van Boezem, Johan Ponsioen and Jan van Munster were affiliated, after which he became active in the Tielse Artists' Societeit and the Dutch Association for Seascape Painters. Three days ago, on 25 July, musician and artisan instrument maker Antón Varela died. Varela was a legend in the field of Galician music; a craftsman, interpreter and composer. 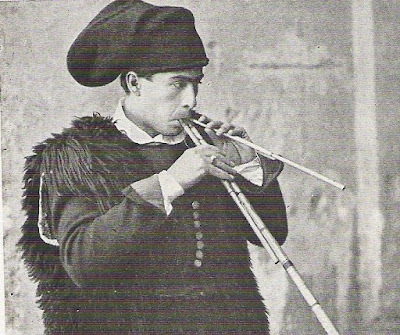 He was best known for his bagpipes, an instrument that plays an important role in Galician traditional music. Varela’s bagpipes are much appreciated for their personal and unmistakable sound. The choice of wood and other materials makes it possible to individualize each bag and adapt it to the characteristics and requirements of each performer. 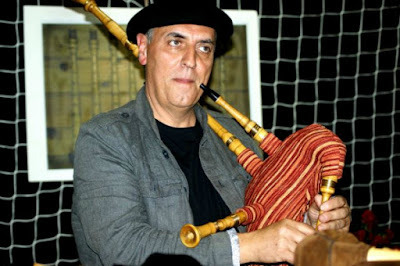 Antonio Varela's bagpipes are exhibited in many museums and his instruments are used by professionals all over the world. 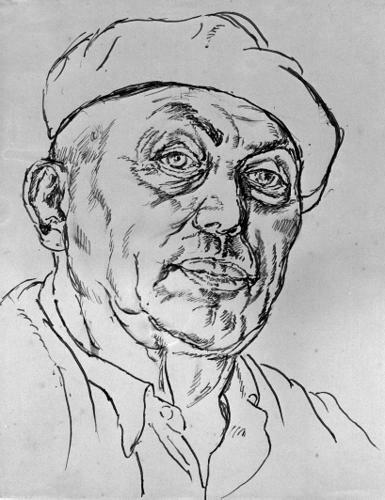 Joseph Henri Gosschalk (1875 - 1952) was a Dutch Jewish painter, known for his (primarily landscape) drawings from his travels across Europe. 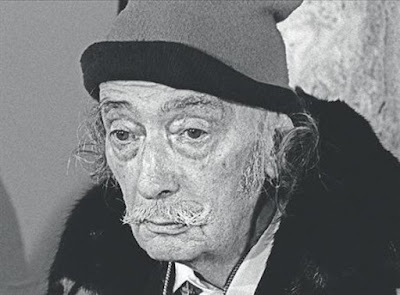 During WWII he was first interned in the Nazi concentration camp Westerbork (Netherlands), before being transported to Theresienstadt. 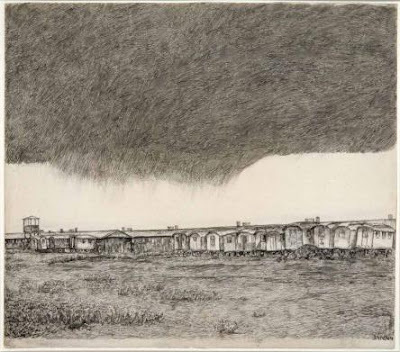 While in Westerbork he continued his work, making drawings and sketches of camp life and the surroundings of the camp. The picture below is of wagons taken from Roma, Sinti and travellers by the Germans and stored at the perimeter of Camp Westerbork. Gosschalk survived the camps and died in 1952 in the Hague. Caricature artists Hugo and Marion draw live on paper and digital (including iPad) at corporate events, trade shows or wedding parties. Their workshop Drawing Caricatures is a cheerful and airy snack during any business or festive gathering! Marion was born in 1963 in Goirle, North Brabant. She loves drawing above everything else, especially in a comic-like cartoon style. During her high school years she was always drawing her classmates. 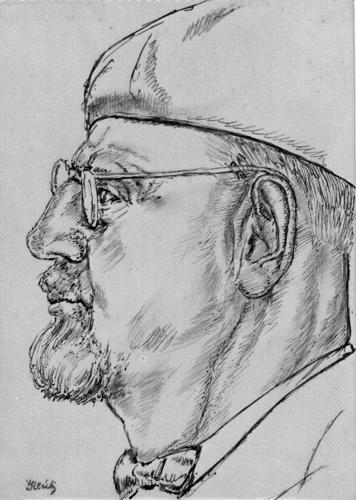 A training as a fashion artist at the School of Art in Arnhem didn’t change that in any way. 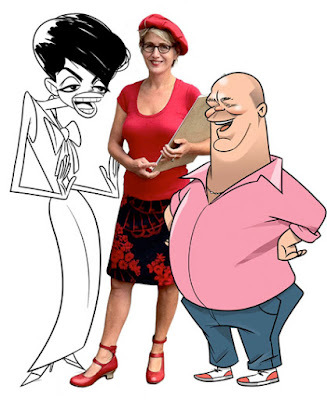 She became an illustrator and caricaturist. 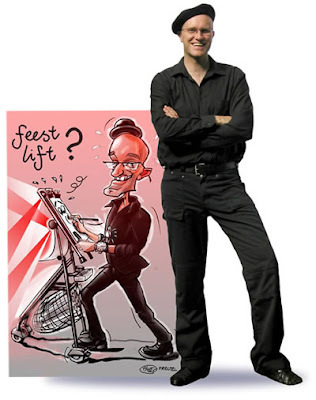 Hugo and she have been full-time caricaturists since 1992. For two years now she also designs her own line of greeting cards: Jakima (also for sale at www.Greetz.com). 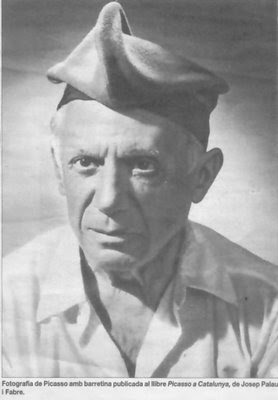 The town Soriana of Valdegeña, halfway between Pamplona and Madrid, will erect a monument to honour the beret. 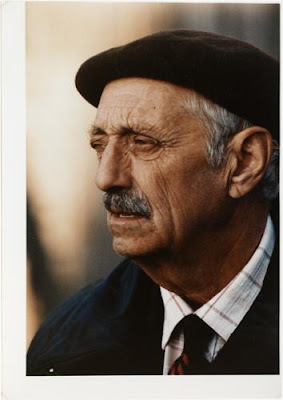 Avelino Hernández, brother of the writer Ricardo Hernandez, says: "I know that my brother would agree to pay tribute to the beret, an essential garment of the rural essence of Soriano and therefore Castilia”. 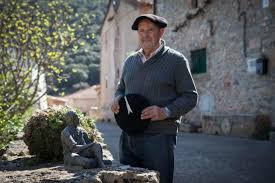 The City Council of Valdegeña, birthplace of Avelino Hernández and his family, plans to place the monument to the beret, a sculpture of the 'iron artist' Isidoro Saenz, in the upper end of the district. Not just for the elderly but for the coming generations who want to root with the culture of their land. 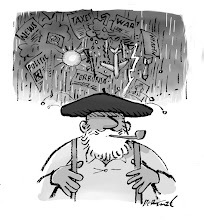 Ricardo says that he puts the beret in September and removes it in April, "because in summer it just bothers". He recalls the times when the garment swarmed over the heads of the majority of the young people and adults of the Soriano area, and indicates that when they were 14 or 15 years old, it was part of the usual attire. 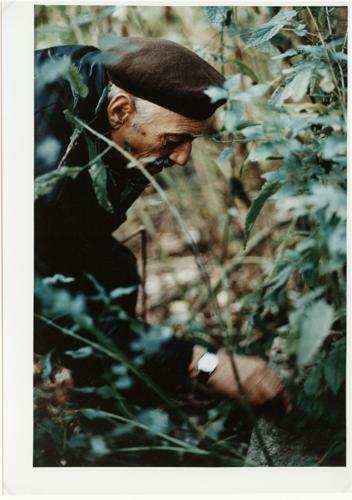 "My father's grandfather, my grandfather, my father and then my brother Avelino and I used it at my house," he says. 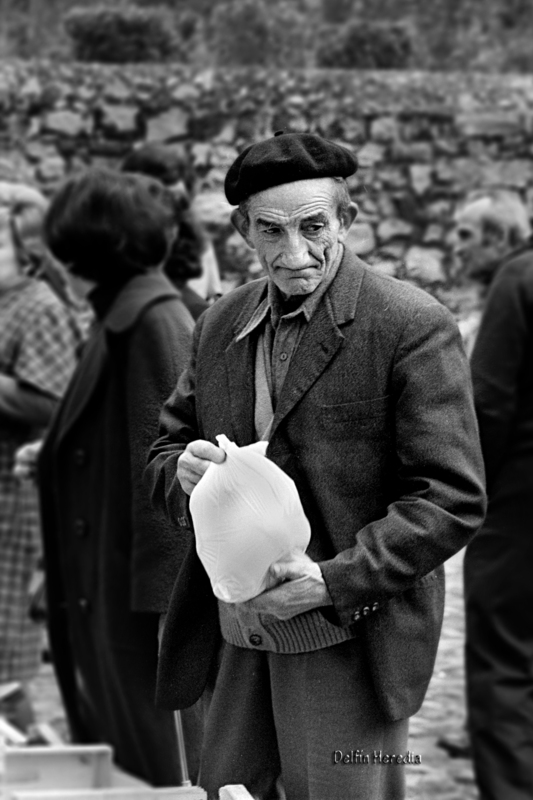 Balmaseda is a town and municipality located in the province of Biscay, in the Basque Country. Balmaseda is the capital city of the comarca of Enkarterri, in western Biscay and serves an important role in the province thanks to its proximity to the capital city of Bilbao and the regions of Cantabria and Castile and León. In the center of the photograph in dark uniform, Villanueva, commander of the Avellaneda Battalion. 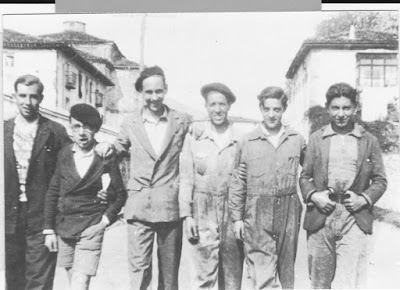 Balmaseda is also an important town regarding the history of beret manufacturing: the La Encartada factory was one of the largest beret manufacturers ever, in operation from 1892 to 1992 (but that’s for other posts). Four soldiers belonging to the battalion Meabe, died in December of 1936 during the offensive of Villarreal. 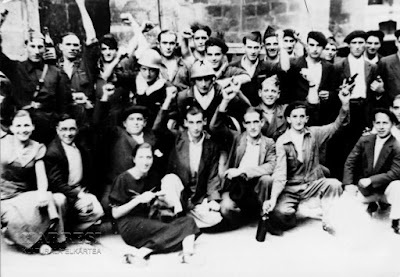 Balmaseda during the Spanish Civil War was a stronghold for the Republican (Loyalist) Army and many Balmasedans volunteered in the militias and army. 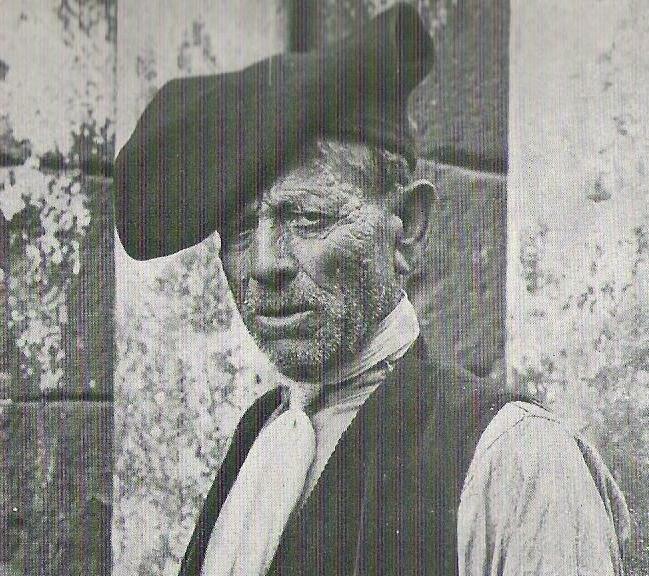 Strong Basque identification was visible in the wearing of txapelas, or Basque berets. 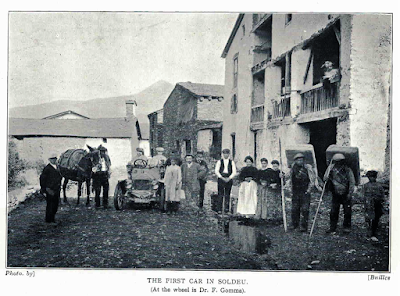 A wealth of information on Balmaseda during the Civil War can be found here. Gudaris (Basque fighters) of the Battalions Saseta and Avellaneda in Marquina, December of 1936. 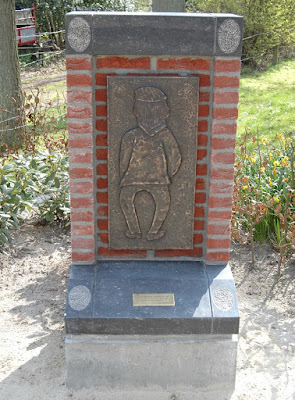 "De Wateraar" ("he who pees", in Dutch) is the Dutch version of Brussels' monument Manneken Pis. 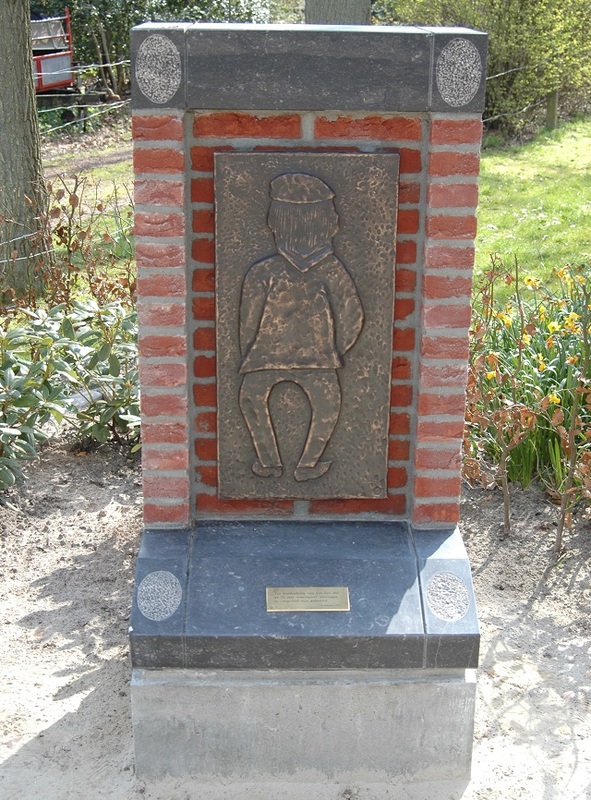 The monument can be found in the small village of Zorgvlied (Drenthe, Netherlands) and commemorates the 25 years it took to build social houses (after the Law of Social Housing had come into place); the bereted man "pees on the law" in protest. 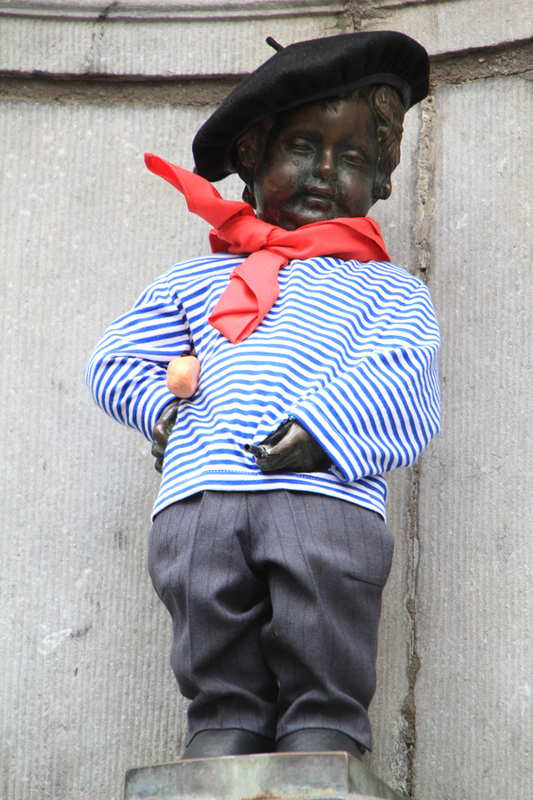 Below his older brother in Brussels, Belgium. 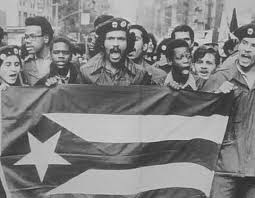 The Young Lords was a Puerto Rican nationalist group in several United States cities, notably New York City and Chicago. The Young Lords began in 1960 as a Puerto Rican turf gang in the Lincoln Park neighborhood of Chicago. 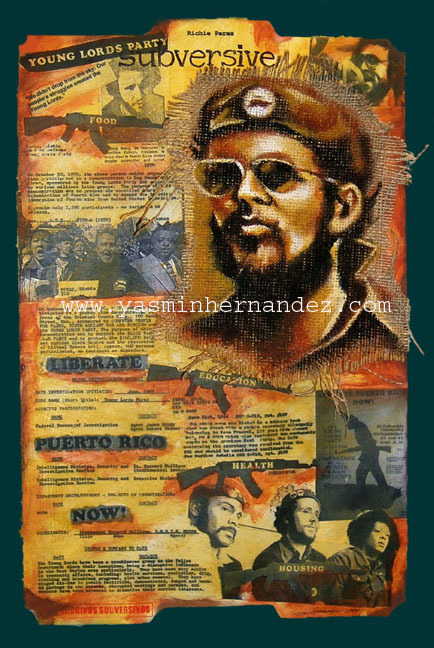 Their president Jose Cha Cha Jimenez reorganized them and became founder of the Young Lords as a national civil and human rights movement on Grito de Lares, September 23, 1968. 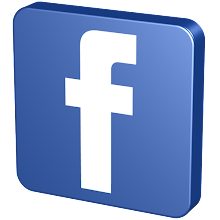 This new community wide movement then spread to nearly 30 cities including three branches in New York. New York City, where one-fourth of Puerto Ricans then lived, and Chicago were the two largest Puerto Rican hubs. 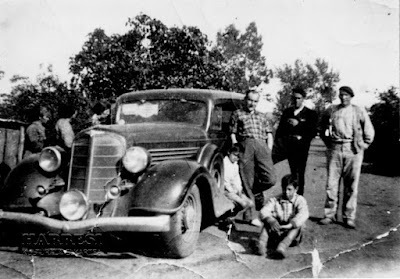 Puerto Rican mainland communities also developed elsewhere during the Great Puerto Rican Migration of the 1950s, so in 1969, subsequent branches organized themselves in Philadelphia, Connecticut, New Jersey, Boston, Milwaukee, Hayward (California), San Diego, Los Angeles, and Puerto Rico. The Young Lords were a target of the FBI's COINTELPRO, which had long harassed Puerto Rican independence groups. 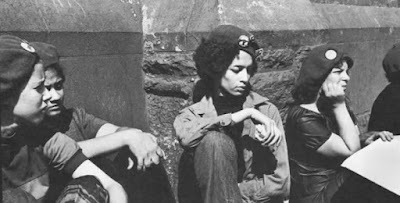 The New York-Chicago schism mirrored the "Divide and Conquer" divisions within other New Left groups like the Black Panther Party, Students for a Democratic Society, Brown Berets and many other new left movements. All of these organizations were repressed. At first, the splits were believed to be the result of growing pains, as this movement was very young and spread quickly. But it is now documented that it was primarily due to police infiltration by informants and provocateurs, and planned and shaped by the ongoing undercover work of the FBI's COINTELPRO. 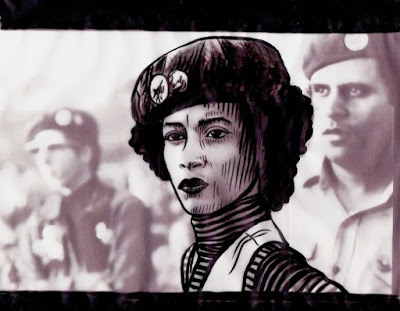 The Young Lords were a target of the FBI's COINTELPRO, which had long harassed Puerto Rican independence groups. The New York-Chicago schism mirrored the "Divide and Conquer" divisions within other New Left groups like the Black Panther Party, Students for a Democratic Society, Brown Berets and many other new left movements. All of these organizations were repressed. At first, the splits were believed to be the result of growing pains, as this movement was very young and spread quickly. But it is now documented that it was primarily due to police infiltration by informants and provocateurs, and planned and shaped by the ongoing undercover work of the FBI's COINTELPRO. 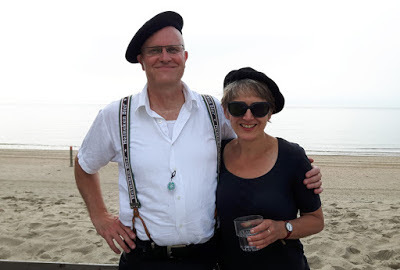 Berets for the Hip, Young & Trendy! Trends may come and go, but it seems French girl style will always have an eternal je ne sais quoi. So when a Parisian-influenced trend pops up, we’re never completely caught off guard. 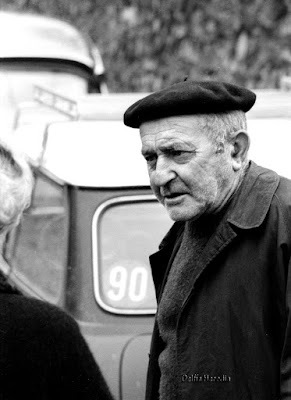 We are, however, always deeply impressed, and the resurgence of the beret has us feeling no less inspired. This sleek hat trend is cropping up as one of the biggest under-the-radar trends on the verge of total Instagram explosion, but apparently, supermodels Bella Hadid and Kendall Jenner, plus mega-popstar Rihanna, have already gotten the memo. 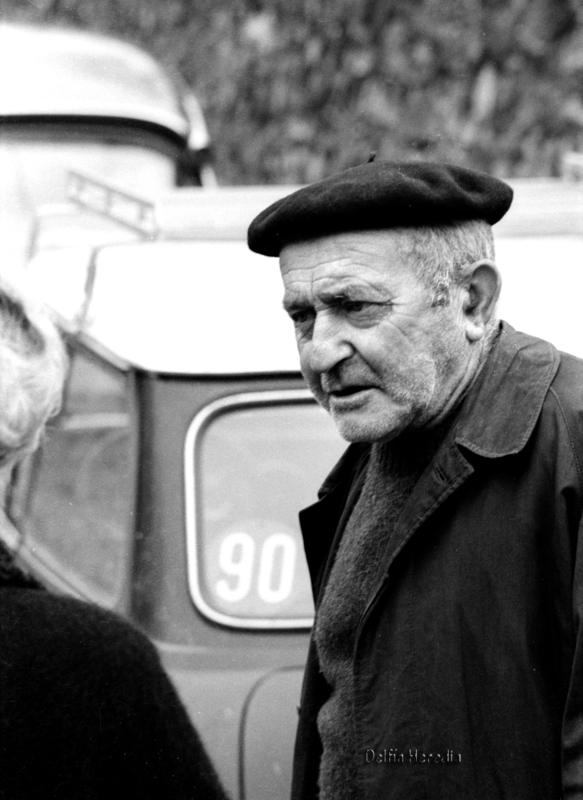 Between the three of them, we’ve seen quite a few chic berets as of late. Now, between Bella and Kendall bringing this trend back to life like the seasoned fashion muses they are, we were already sold. But like we said, they’re not the only ones who caught onto it. 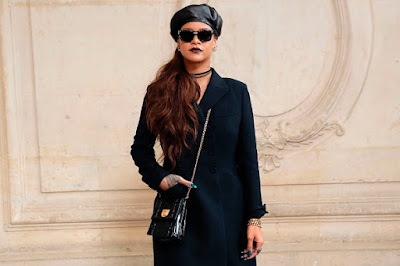 Nope, Rihanna also sported a posh leather beret during Paris Fashion Week, as did the majority of the Dior darlings both on and off the runway at the designer’s recent show. 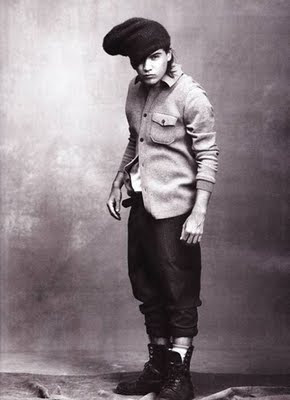 Clearly, this is piping up to be one trend du jour that will soon be everywhere. But thanks to these fashion-forward ladies, we’re already in the know! Posties and couriers are very frequent visitors at Beret HQ in Wellington, but the best deliveries are those that are completely unexpected. This morning, I found a small parcel in my mailbox with two books from my German artist friend PLG (see here and here). 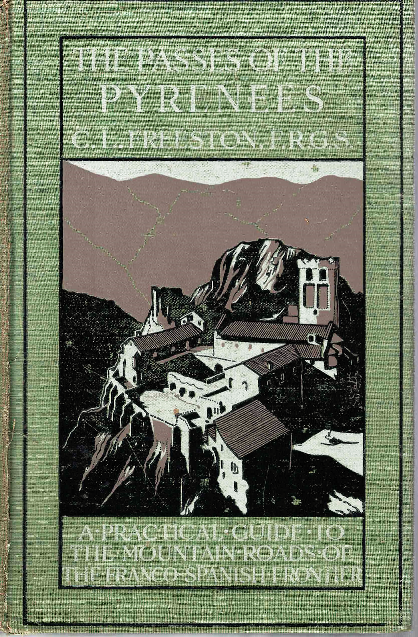 One the famous Pyrenean book by Kurt Tucholsky (a 1952 edition in it's original language), but even more spectacular to me, a fantastic guidebook to the Passes of the Pyrenees by motorcar from 1912! What a delightful book! Written by C.L. 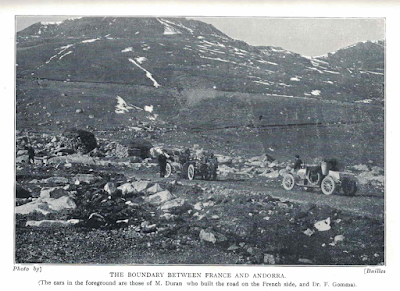 Freeston, a Fellow of the Royal Geographical Society and full of maps and photographs, typically showing horse drawn carriages and early automobiles on what was already then a very advanced road network across the passes. 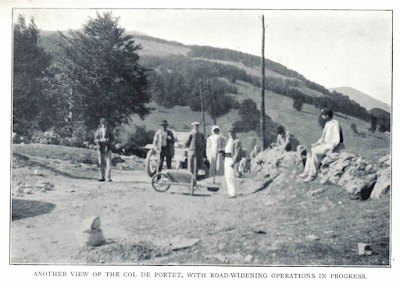 And yes, even a few berets, worn by pelote players, road workers and carriers. If you have the chance to lay your hands on a copy, I'd highly recommend it. I found several available on abebooks.com and even an e-book version in downloadable PDF. 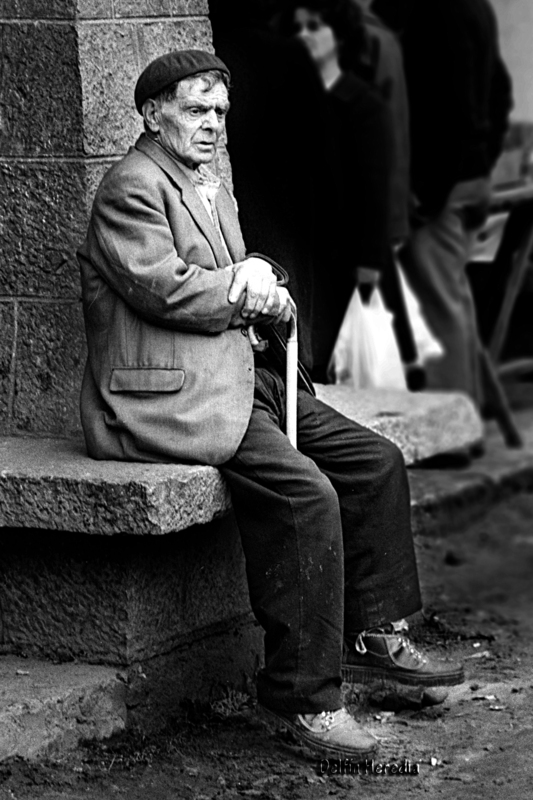 Traian Băsescu (1951) is a Romanian politician, who served as the fifth President of Romania from 2004 to 2014. His two consecutive terms in office are marked by the adhesion of Romania to the European Union in 2007, but also open conflicts with the Parliament, leading to two failed impeachments attempts against him in 2007 and 2012. 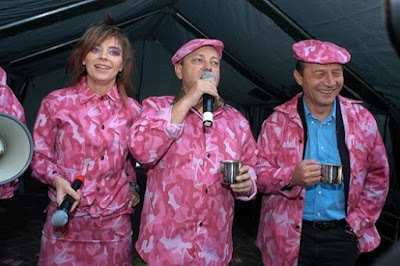 Pictured here in pink camouflage on a satirical website, claiming “In this camouflage suit Basescu looks like a hero of the Resistance - Resistance to drink” and “very effective camouflage when he wants to hide from waiters that come with the bill”.